Here is my DT card for the Challenge. 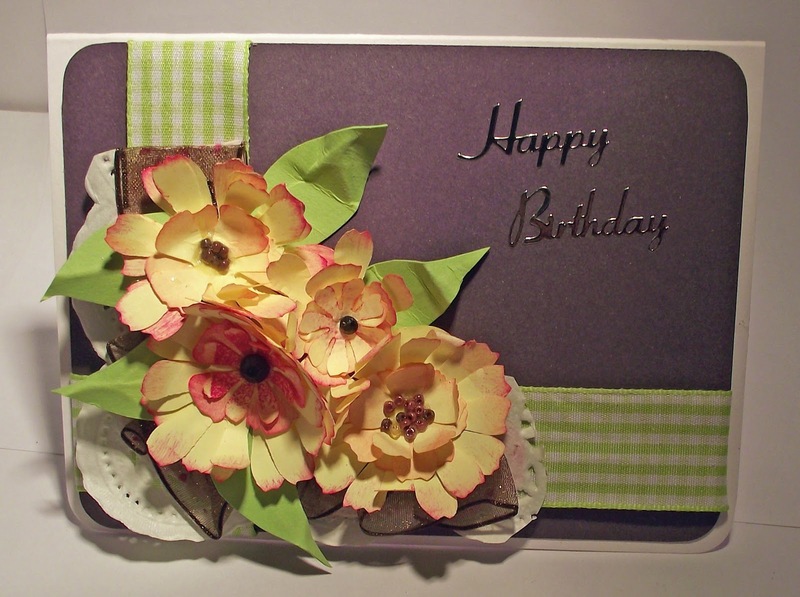 The roses were made from normal weight pale yellow paper using various punches of petal shapes. To create the 'tattered' effect I snipped the tip of each petal with a decorative scissors which had a rough or uneven cutting edge. This is a tip I found on You Tube and this is a great idea if, like me, you don't own a Tattered Florals die. The tips of the roses where then rubbed with some Stäz-On Blazing Red ink to contrast the yellow and the petals were then layered to form the rose. The centres were made using Glossy Accents, seed beads and a couple of dark brown gems. The leaves were hand cut and each leaf was scored to create the spine and veins. I arranged the roses onto a piece of card that had been decorated with a piece of white doilly and brown and gold organza ribbon. I then matted a piece of lilac cardstock with a green gingham ribbon band onto a standard white card base and placed the roses at the base of the gingham ribbon. A silver peel-off Happy Birthday completes the card. Thanks for taking the time to stop by to read my blog. Your time and comments are appreciated. great inspiration for the challenge!